India slipped down one place from 130 to 131 among the 188 countries ranked in terms of human development, says the 2016 Human Development Report (HDR) released by the United Nations Development Programme (UNDP) on Tuesday. India’s human development index (HDI) value of 0.624 puts it in the “medium human development” category, alongside countries such as Congo, Namibia and Pakistan. It is ranked third among the SAARC countries, behind Sri Lanka (73) and the Maldives (105), both of which figure in the “high human development” category. The HDI is a measure for assessing progress in three basic dimensions of human development: a long and healthy life, access to knowledge, and access to a decent standard of living. The report says 1.5 million people worldwide still live in multidimensional poverty, 54% of them concentrated in South Asia. While poverty fell significantly from 1990 to 2015, inequalities sharpened in the region. South Asia also had the highest levels of malnutrition in the world, at 38%, and the lowest public health expenditure as a percentage of the GDP (1.6%, 2014). India’s public health expenditure was even lower, at 1.4% of the GDP. However, it did make some gains between 1990 and 2015, improving life expectancy by 10.4 years in this period. Child malnutrition also declined by 10 percentage points from 2015, and there was a modest gain in infant and under-five mortality rates. The report praised India’s reservation policy, observing that even though it “has not remedied caste-based exclusions”, it has “had substantial positive effects”. It pointed out that “in 1965, for example, Dalits held fewer than 2% of senior civil service positions, but the share had grown to 11% by 2001”. The HDR also hailed the national rural employment guarantee programme as a “prime example” of “combining social protection with appropriate employment strategies”. The report noted with approval India’s progressive laws, especially the Right to Information, National Food Security, and Right to Education Acts. It commended the Indian grassroots group Mazdoor Kisan Shakti Sanghatan for popularising social audits of government schemes. Noting that women, on an average, have lower HDI than men across the world, the report pointed out that the largest gender disparity in development was in South Asia, where the female HDI value is 20% lower than the male value. In South Asia, gender gaps in entrepreneurship and labour force participation caused an estimated income loss of 19%. “Between their first and fifth birthdays, girls in India and Pakistan have a 30% to 50% greater chance of dying than boys,” the report noted. 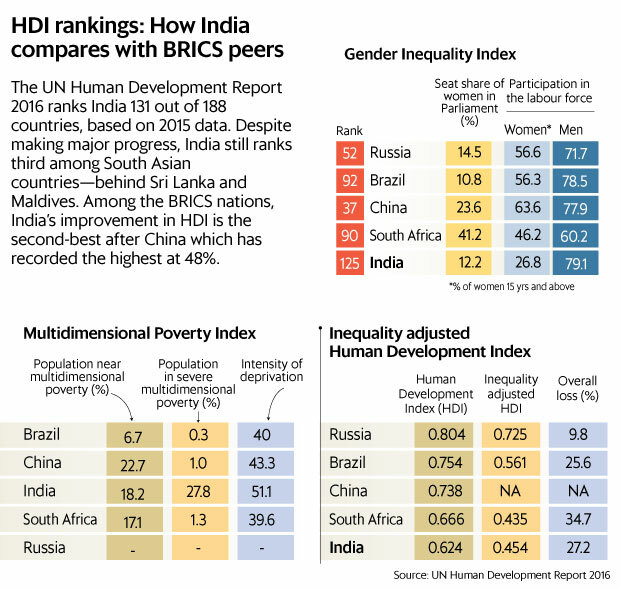 While India’s HDI value increased from 0.428 in 1990 to 0.624 in 2015, it still had the lowest rank among BRIC nations. However, its average annual growth in HDI (1990-2015) was higher than that of other medium HD countries.